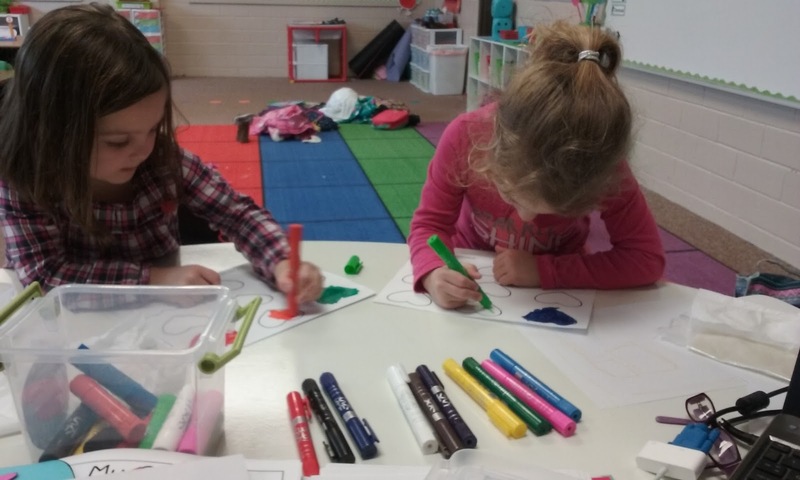 My kindergartners love to paint! 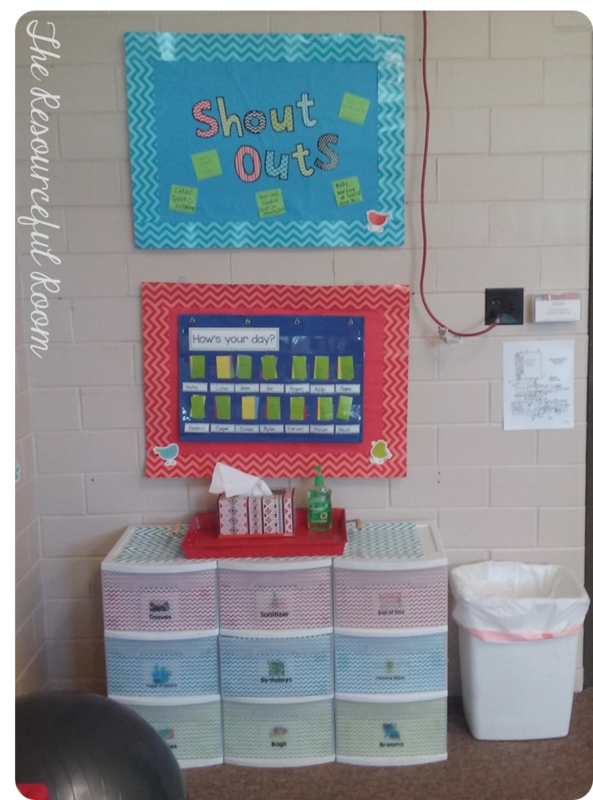 I want to give them opportunities to do that but sometimes its just to much work to get everything out and organized, then clean up in a classroom with no bathroom or sink. I don't want paint on the carpet and having water to clean things with is always a problem. So when I found Kwik Stix made by The Pencil Grip I was so excited. These paint sticks are so amazing! They give my students the opportunity to paint without the mess, and they dry quickly (within 90 seconds) so we can take our work home the same day! My students ask to use them everyday. They've become a favorite activity for word work and free choice center time too. The new Thin Stixs are great. My students can easily write with them or color smaller pictures more precisely. 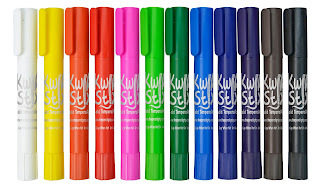 I think Kwik Stixs are a must have in every kindergarten classroom. If you are looking for another great product to add to your word word or art center you have to get these! 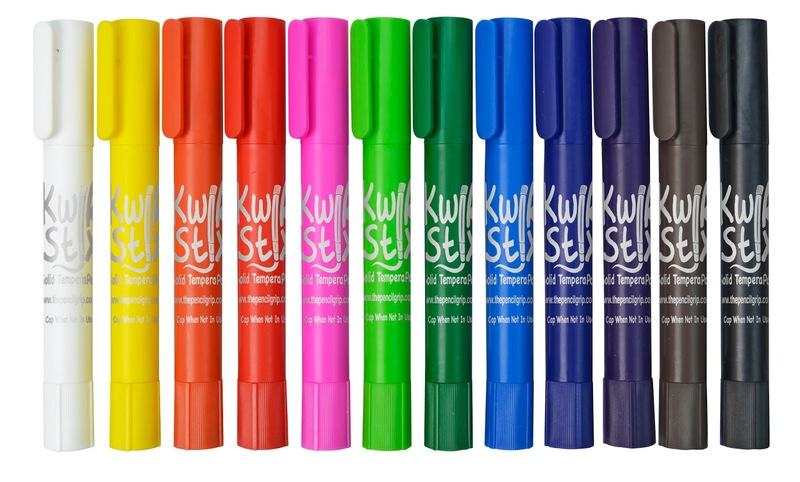 You can find Kwick Sticks on Amazon HERE! It’s Apple Day! 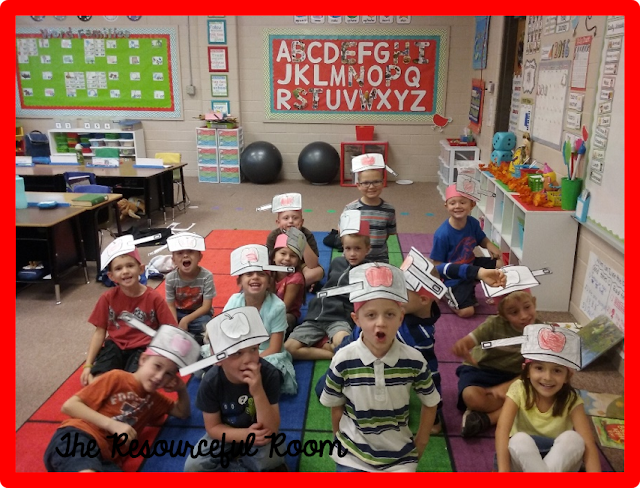 We had a lot of fun learning about Apples and Johnny Appleseed this week. We started the morning with apple tasting. We tasted red delicious, golden delicious (yellow), and granny smith (green) apples and used our five senses to describe each one. 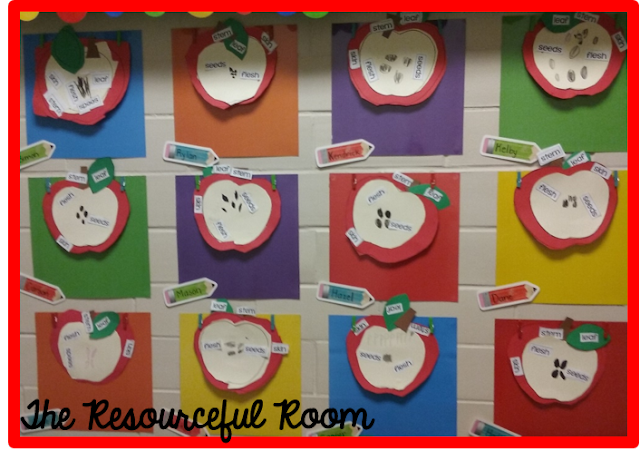 Then each student chose their favorite and colored their apple the corresponding color. 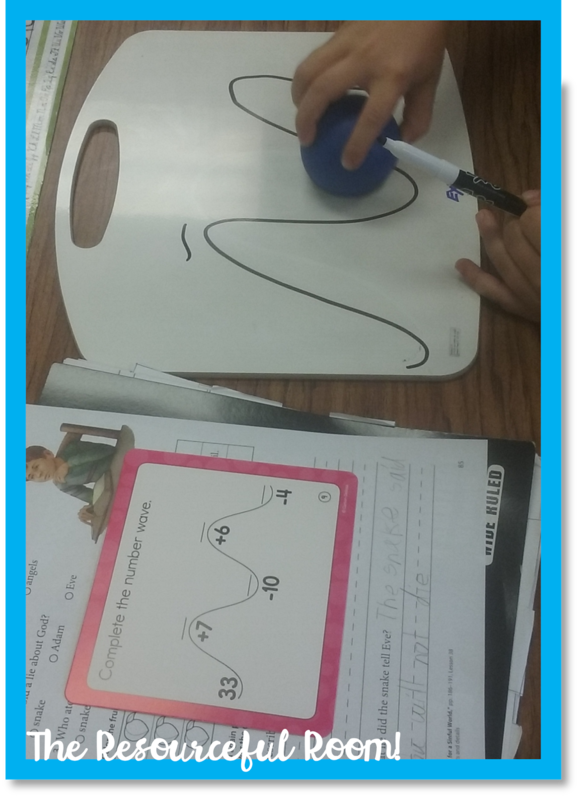 I used poster board and cut out an apple shape to make our graph. 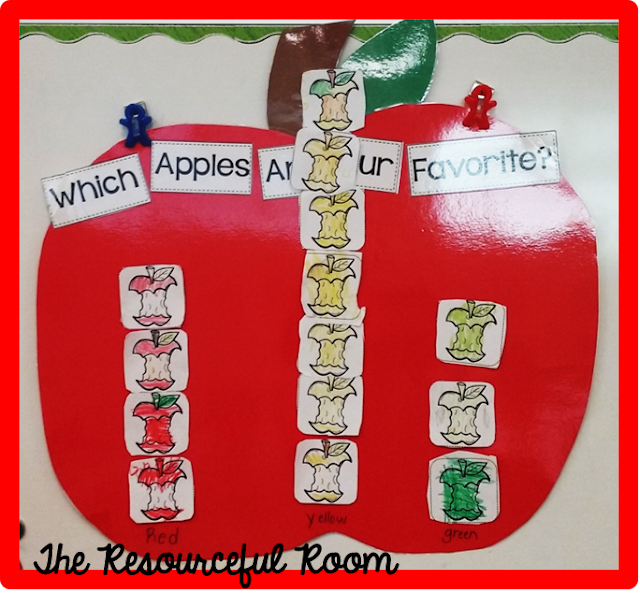 The printables for the graph are from Stephanie Stewarts Smart Apples unit. Then we talked about which color had the most, the least, how many more, and how many less. For the rest of our math lesson we made these “I See Apples” books. This book was free HERE! Then we read about Johnny Appleseed and made hats just like Johnny wore! You can get the free printable from Simply Kinder! 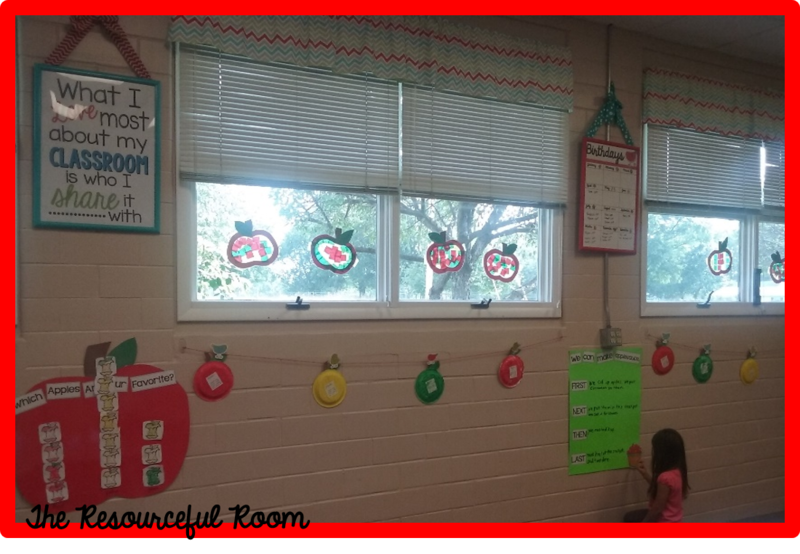 We read about apples through the seasons and the apple life cycle. 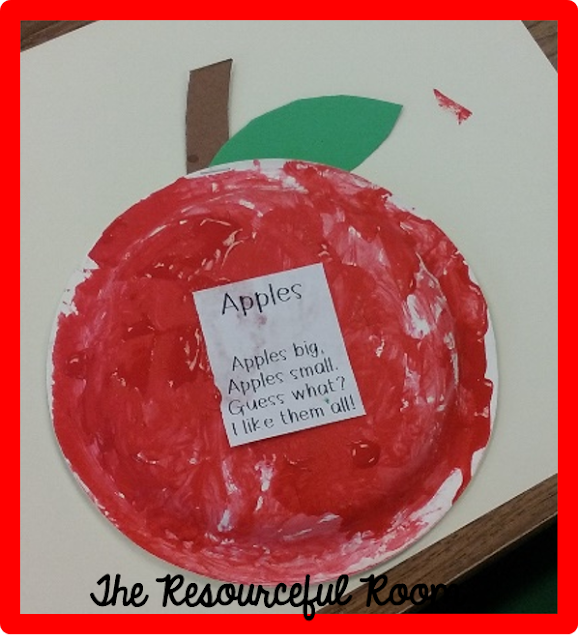 Then we made this apple labeling craft. This is also from Stephanie Stewart's Smart apple unit. 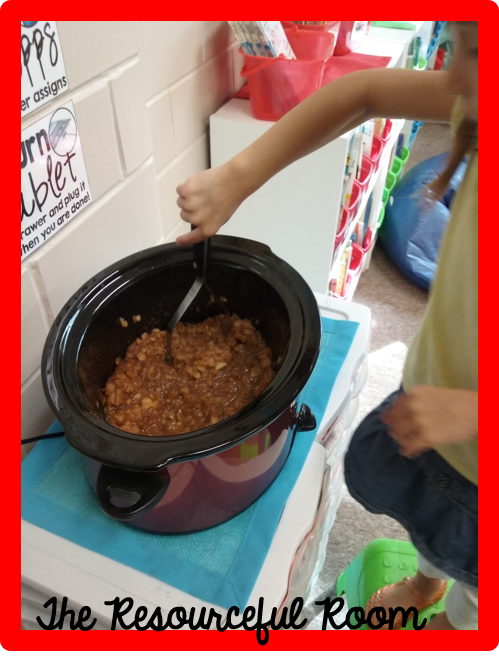 We made applesauce, following a recipe, measuring and following directions! 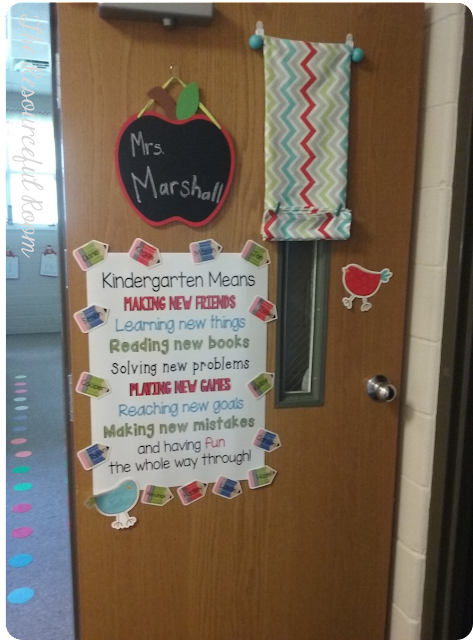 Also from Stephanie Stewart's Smart Apple unit. 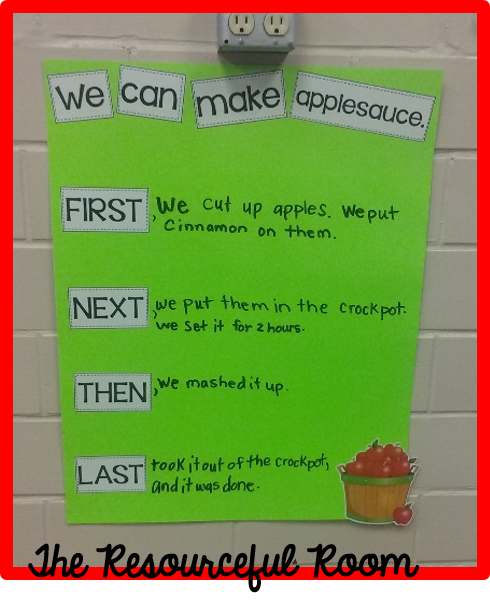 Then we wrote about how we made the applesauce with this shared writing chart. I used poster board and laminated it so I can reuse it later! We painted paper plate apples and put this little poem on them! 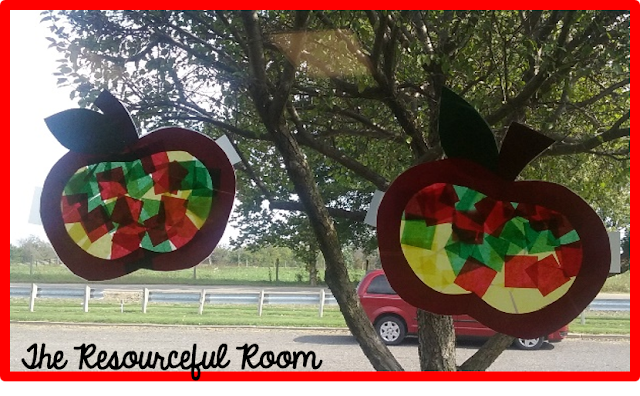 And we made stained glass paper apples to decorate our windows! This template is Free from Maria Gavin at Kindercraze. 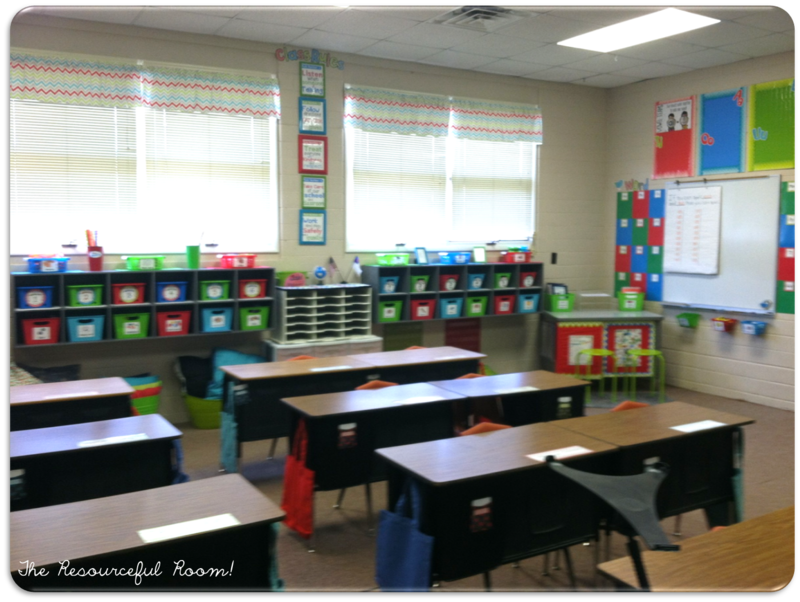 It was a fun day and our room looks and smells so good! Thanks for stopping by and reading about our day! We have grandparents day and a pumpkin day coming soon. I can't wait to share it with you! I am teaching Kindergarten! It's my dream job! Really, I couldn't be happier. I spent a good part of my summer putting together a welcoming classroom for my little ones and I want to share all of it with you, so let's take a tour of my new room! I'll leave links to the things I have purchased and try to explain as much as possible, and I've got several freebies for you!! This is the view from the door. It's a pretty small room but I've tried to make the most of the space. You can see my "teacher" small group area, the library and students desks. Under each set of windows I strug a length of twine and clipped student work up for a fun and easy work display. These drawers are directly to the left of the door, they store any type of cleaning/organizational things we may need such as baggies, cleaning wipes, brooms, paper plates/cups, and extra Kleenex. Above the drawers is our behavior tracking system we use a colored card system K-3 to keep consistency. I added a shout out board for students who are going above an beyond. We give them a shout out cheer, their name goes on the board and they get a couple M&M's. They are so proud when their name goes up there! The back wall has two large boards, they are actually shower board but they are old and I decided to use them as bulletin boards instead of white boards. 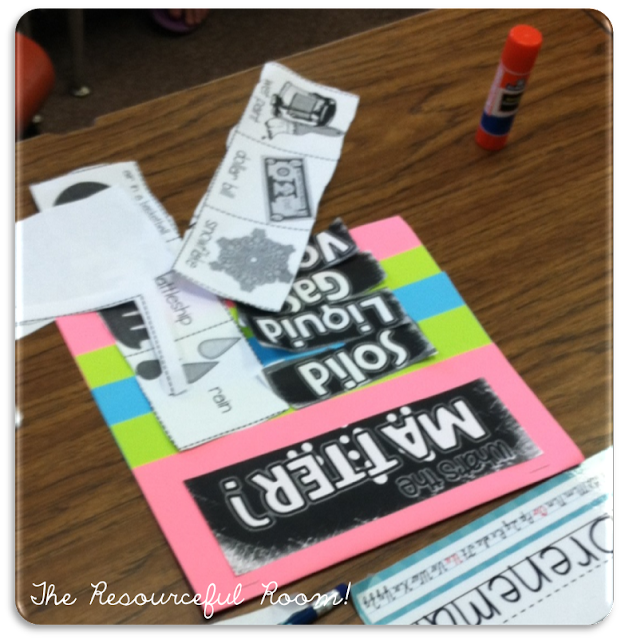 This one has our interactive alphabet, where we add pictures to the letters we learn each week. 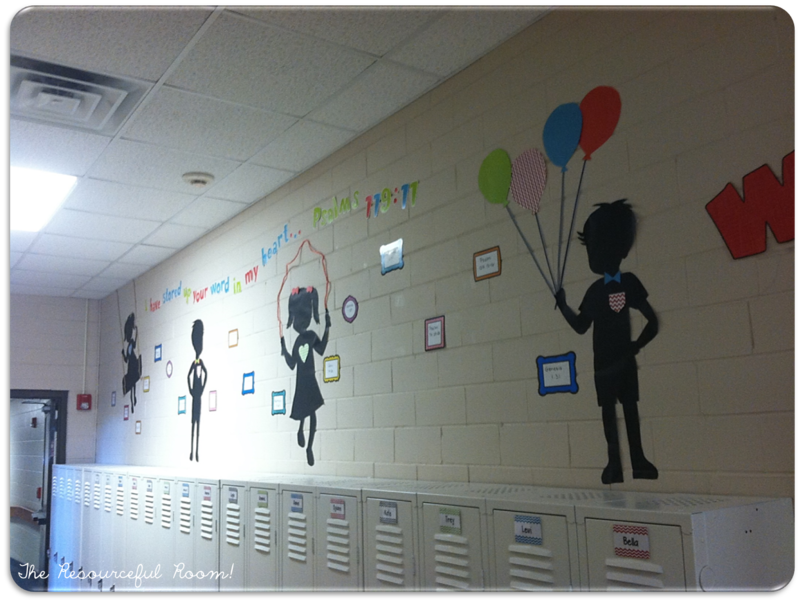 I got this idea from Maria at KinderCraze, you can check out her blog for directions! Under the board is our sensory table, I found the directions for making this out of pvc pipe and a storage container on pinterest. It works really well. I have two yoga balls for kids to sit on while they work if they prefer. the drawers underneath hold sensory table supplies so I can switch them out with the seasons. 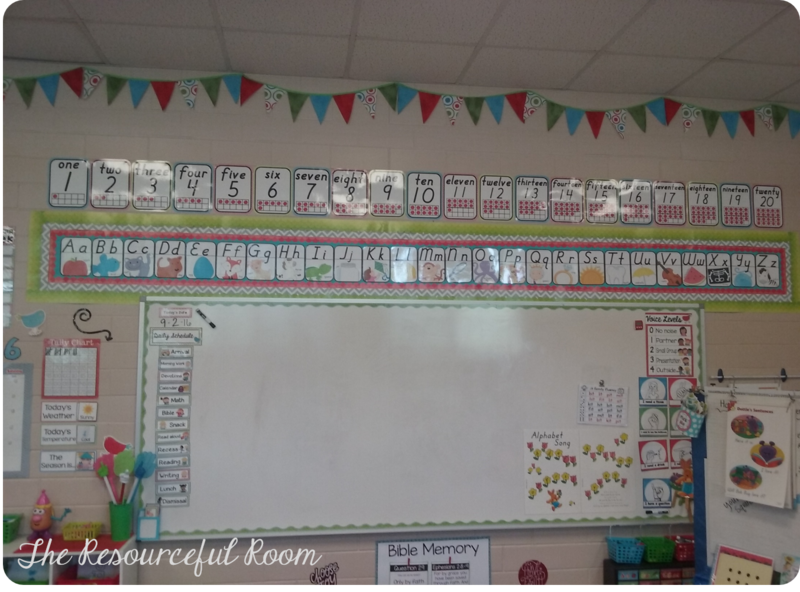 Above the board are my shape posters! The letters that spell "shapes" are typed one letter per page in one of my favorite fonts, printed and cut out. I added a solid color under each letter for a "shadow" effect. This is an awesome idea I got from Kacey at Doddle Bugs Teaching. Her letters on her boards are always amazing! The shape posters are free! Next to the alphabet board are our class rules. I got the chalkboard from Target dollar spot and added a cute ribbon for hanging. The rules are also from Maria at Kindercraze. The drawers underneath are our class mailboxes. The green bin on top holds our daily folders, at the end of each day we take our mail from the drawer and put it in our folders to take home. This is the second big board along the back wall. It is holding our word family word wall. Our curriculum is big on word families and I am glad for the space to display them. The "word families" and "colors" letters are the same font I used for shapes printed one per page and cut out. Under the board on the white shelf are our morning work tubs, center tubs, and puzzles that can be used during free choice center time. I will explain more about what is in each of these in a latter post. The cart in the corner is holding the larger center toys such as Legos and large ABC foam shapes. Above the board are my color posters. I printed them round and put a piece of scrapbook paper in the corresponding color under each to help them stand out. These are also free you can grab them HERE! Here's a view from the other side of the room! This is the front of the room and our meeting space. I love this carpet I got this year from Kidcarpet. It is perfect for giving everyone their own space! I have it right at the front of the room so all of our important learning posters and displays are quickly accessible while we are here. To the left is our calendar area and more center tubs. 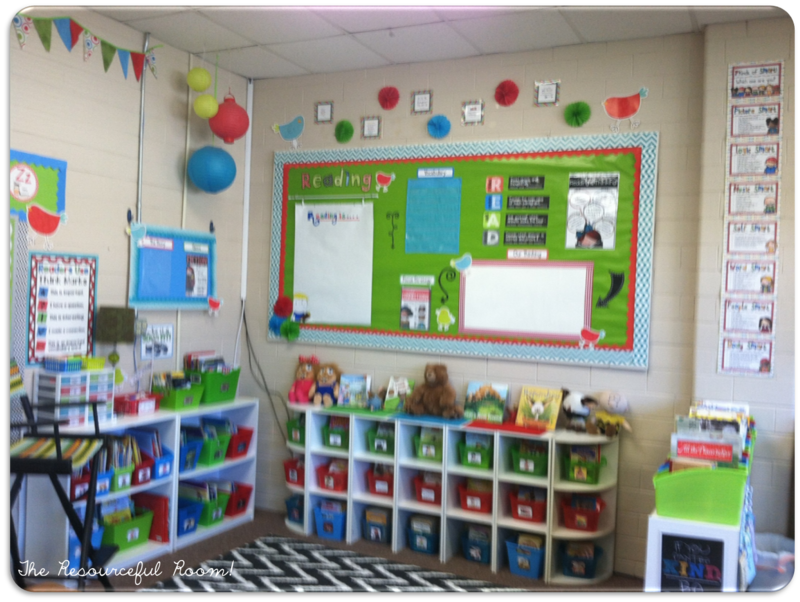 Above the white board are my alphabet and number posters that can be found in my TPT store. To the right is my teacher small group area, I will explain more about that in a little bit! Next to my teacher area these drawers hold our tablets. We are one to one with Samsung Galaxy Tablets this year and I am loving it. These drawers hold the tablets perfectly. Tablet rules are above the drawers you can get them free HERE! I love, love, love the vinyl quote under the clock I bought it on Amazon! 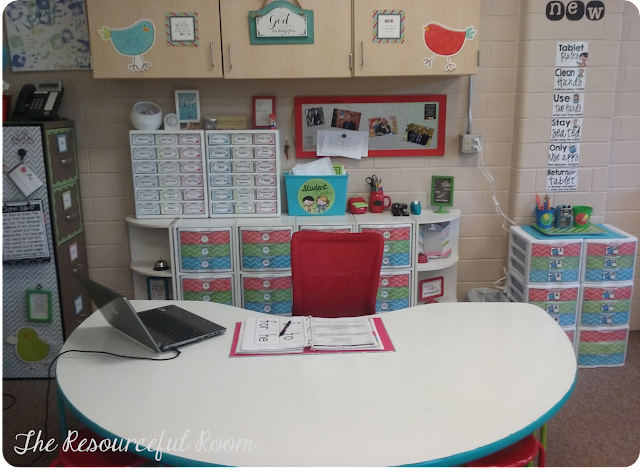 To the right of the drawers is our class library! This is my favorite space!! I love books! Having an inviting and organized library is always a must for me. I loved putting this space together. I organized my books by character and theme. 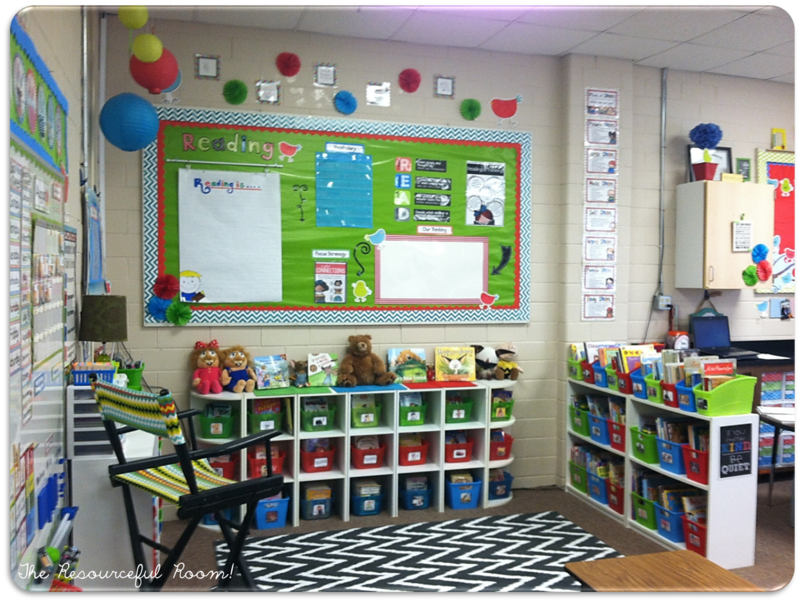 I made my own labels and put the same picture on each tub and book so students will know where to return them easily. 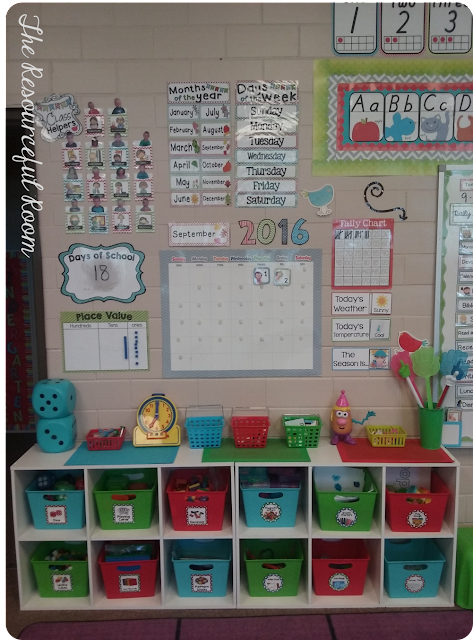 The bins on the top are from Dollar Tree, the bins on the shelves are from Steps to Literacy. The rug is from Walmart. Along the wall we have a tub of reading buddies and a tub of big books. The small front facing shelf holds our theme books for the month. Right now it's back to school books. In the corner you see our carpet bags hanging on a coat rack I got from Hobby Lobby. I love this storage solution! Carpet bags are a great time saver for us! Learn all about them over at Kindergals! The Creative Teaching Press Tweet Birds have been a favorite of mine for the past few years. They started my color scheme and I've kept the poppy red, lime gree, aqua blue going throughout the room. I think it brings a unity that keeps the room from looking to visually cluttered. This board says "Friends of a feather read together: the READ sign is from Target dollar spot. Each of the birds has a student name on it. This is my small group/teacher area. Behind my table I have closet organizer shelves from closetmaid that just happen to fit the sterilite three drawer units perfectly. I put border inside each drawer, and labeled each drawer with a number. All of the supplies I need for my reading lessons that week are in the drawer. So drawer one holds all of our reading materials for week one and so on. I found the corner shelves several years ago at Walmart in the same closet organizing section, they are closetmaid brand but I have not been able to find them recently. I painted my table with dry erase paint this summer and love it. I used blue duck tape around the edge to give it some color. The stools are from Family Dollar. A closer view behind the table. The smaller drawers on top are my teacher toolbox, they hold all the little things that would go in a desk, but free up so much space. I also have a bin for my student assessments and I found the magnetic tin board at Michaels on clerance this summer for just $2.00! I love how it added a place for me to post notes and some family pictures. The cubboards above my shelves house all of our math maniuplatives and extra supplies we need frequently. One more view of my little space. Someday I am going to paint the filing cabinet but for now I used contact paper to cover the side most often seen. It's another great space saving place to hang things we need often. This is our calendar area and center bins are stored underneath. 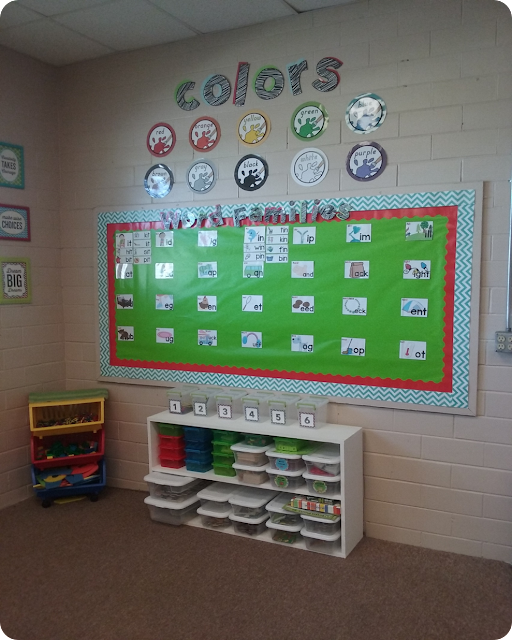 I have six math stations and six word work stations that students cna choose from during rotations. The bins are from Dollar Tree. The shelves are six cube organizing shelves from Walmart. We do a basic calendar routine every morning. We count the days of school and use place value blocks to make the number,we also make tally marks for the number of days. We sing the days of the week and months of the year. 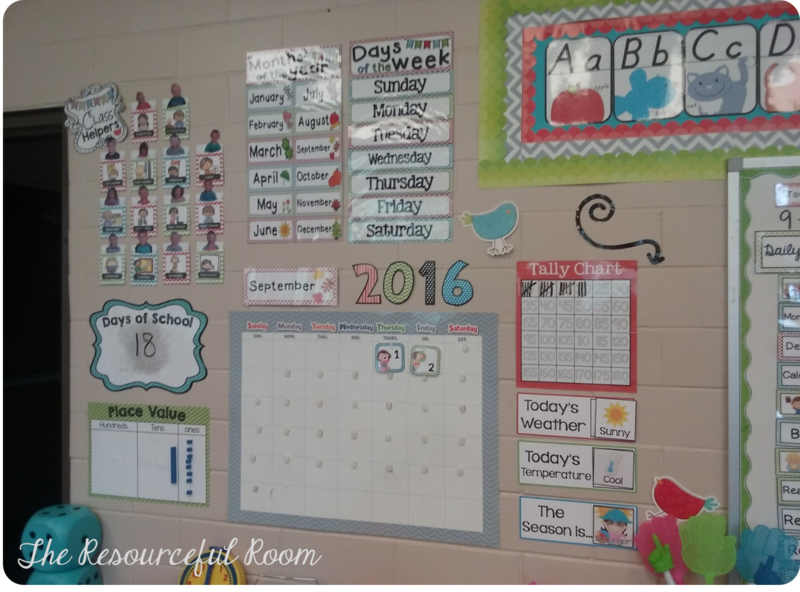 We talk about the weather and our class jobs are displayed here. 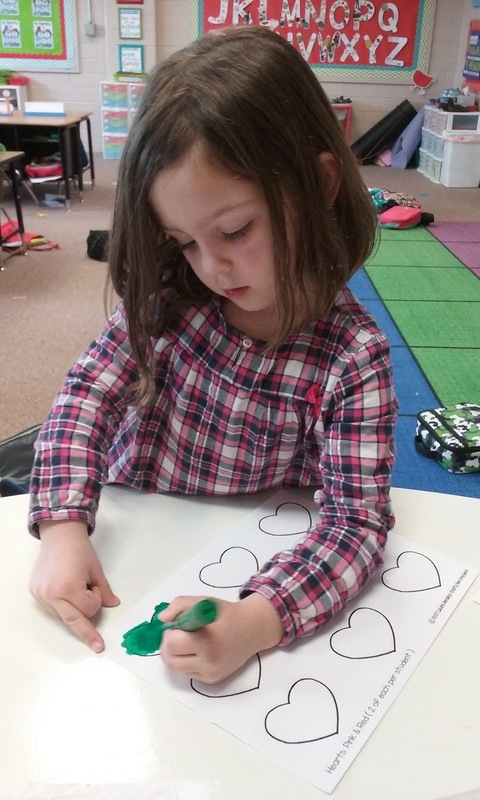 The tally mark chart and weather charts are from Maria at KinderCraze. The month and day charts are free HERE! I really love my job chart this year. I used these library pockets from creative teaching press and made job signs for the front. I just hot glued these pockets to the wall. We took pictures on the first day and I cut them out, put them on a popsicle stick and we use them to show who has each job. One more view of our calendar area! 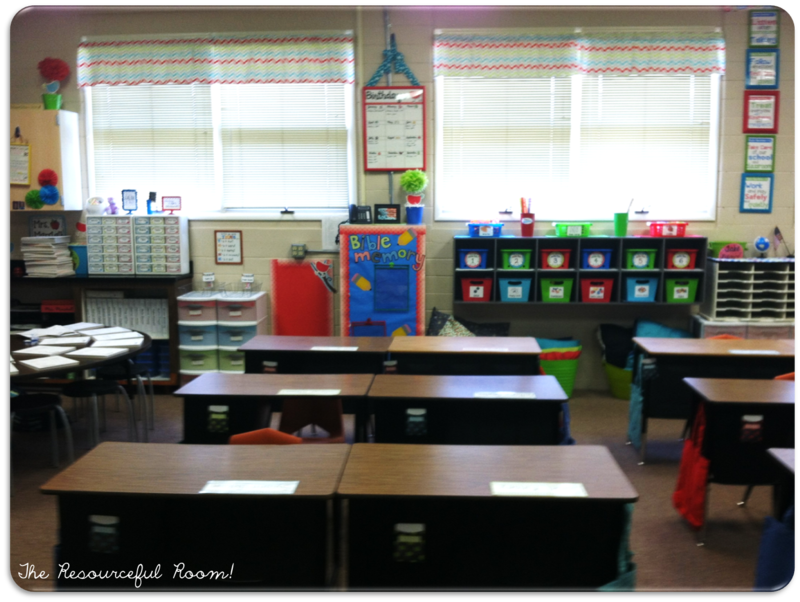 This is the front of the room where most of our learning happens. The number posters and alpahbet line are both in my store. I have used the precursive font because that is what is required at our school. I have also added them in a primary font for those of you who don't use precursive. This is the inside of my door. The apple is from the Target dollar spot. I made the security curtian to match our classroom curtians, and the poster I found online but I can't find it to give credit. If you recognize it please let me know so I can give credit where due! I printed it larger through vistaprint and used Creative Teaching Press Small Pencils to add each students name. Here is our room from the hallway. I printed the "welcome" letters and made the wreath a few years back. I still love them! Our work display is another favorite of mine! It was a last minute idea that popped into my head and came together so well. I love hanging our work here for everyone to see. 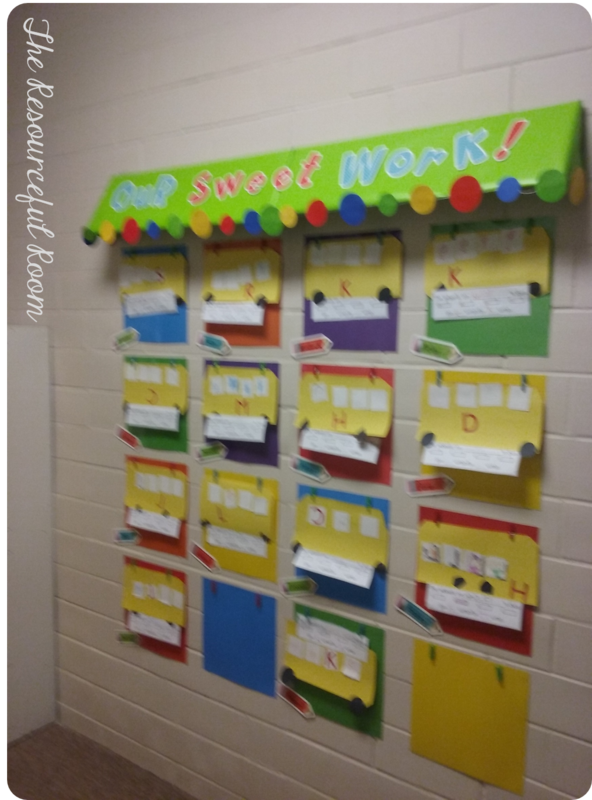 Here's a better view of "Our Sweet Work" display! I made the awning with foam board from the dollar tree. I just scored through one side and bent it then used duck tape to keep it at the angle I needed. This is two boards put together. I covered both boards with green wrapping paper and the dots along the edge were a birthday party decoration I got from Walmart for a dollar. I just cut them apart and glued them on the edge. I laminated scrapbbook paper and hot glued it to the wall. Then glued mini clothes pins I got from Michaels to each piece. I love how it brightened up our entryway! So there's my room for this year. We are now 22 days in and I am loving every minute of it. 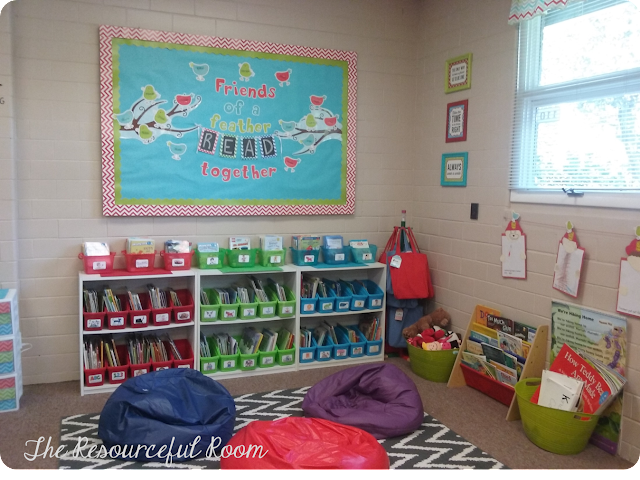 We just started reading groups and stations so I hope to be back soon sharing some fun ideas we are using with you! Thanks for reading, happy teaching! I Know it's been a while since I've updated on our classroom happenings. This year seems to be flying by faster than ever before. We've been having a great year but I haven't had any time to sort through all the pictures and put a post together. I'm hoping to get it done soon! For now I wanted to stop by and tell you about some great new products that I'm loving right now. This Differentiated Reading for Comprehension book has been great. It has engaging stories at three levels so that it's easy to use with small groups and differentiate for different abilities. My students have loved the stories and they have done a great job with answering the questions which was definitely a new skill for them when we started these. 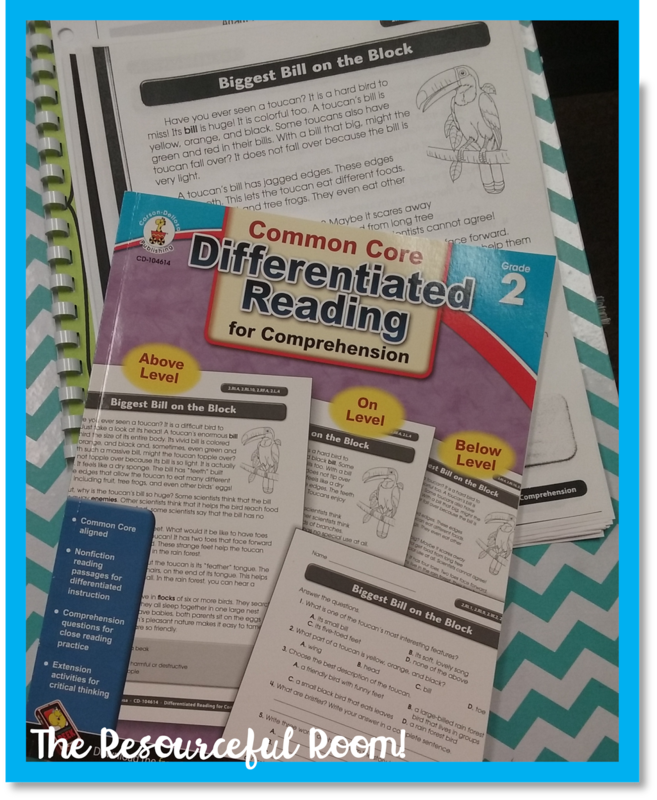 I have been using these with my small reading groups but they would work well for whole group instruction as well. Great practice for finding proof within text. I think these would also work great for assessment. For math these Curriculum Cut-Outs have been the perfect warm-up activity for us! I punched holes in the cards and put them on these rings. When students come in from recess they grab a ring and take it to their desks, then they get out their white boards and complete the problems. The cards review a variety of skills that are fun and great practice for us in second grade. My students can't wait to get them out each day. Now our time after recess when some are getting drinks and using the restroom is actually productive and meaningful. 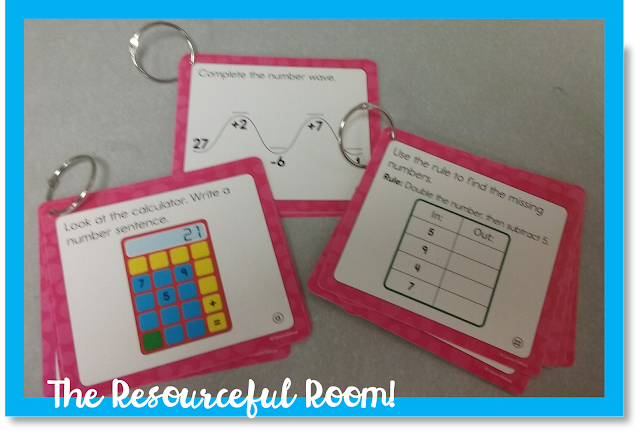 You could use these as task cards, early finisher activities, or small group review as well. I am very happy with them. Thanks so much for stopping by! I hope to be back soon with much more from our classroom! A few years ago I was going through expensive electric pencil sharpeners like crazy, I had three new sharpeners before Christmas an all of them ended up broken. So I decided I was going to have my students go back to using the good old fashioned crank sharpeners. I started looking for one online an I ended up finding a sharpener that changed all my pencil troubles! 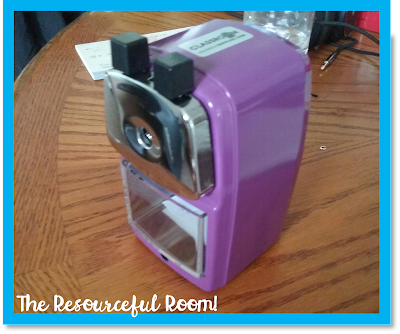 Classroom Friendly Supplies sells the BEST sharpeners I have ever found. They sharpen pencils to the perfect point and they don't chew up the plastic coating on the decorated pencils. My students can use them easily and I haven't had them break once! I even decided to go back to electric sharpeners last year and after two went down within a couple months, I went right back to these and haven't regretted it! I have a blue and a black one in my classroom, my son even took one with him to college! When I saw the new color I just had to have one! I am in love with the new POPULAR PURPLE!! It's so pretty! 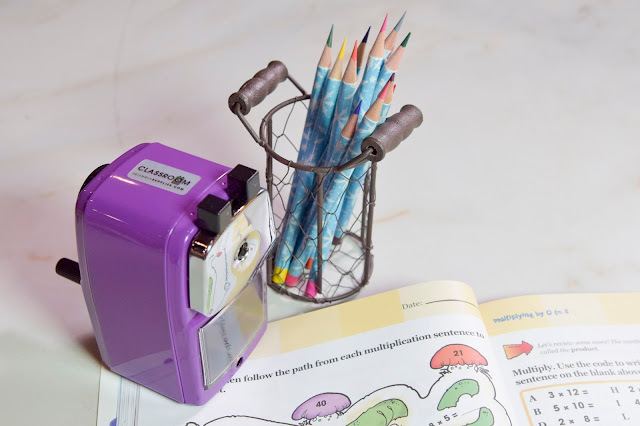 I have been excitedly sharpening away, and my students were so excited to see a new sharpener, they've been using it like crazy. Just like before I haven't been disappointed. It works beautifully! 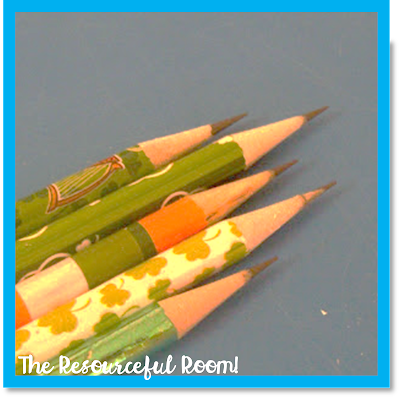 Want to put an end to pencil sharpening headaches? Go on over to Classroom Friendly Supplies and get one for your classroom. They come in lots of cool colors, sure to match and decor, and they are very economical, so you won't break the bank getting one - or two! Know a teacher who could use one? These would also make great gifts for the upcoming holidays too! 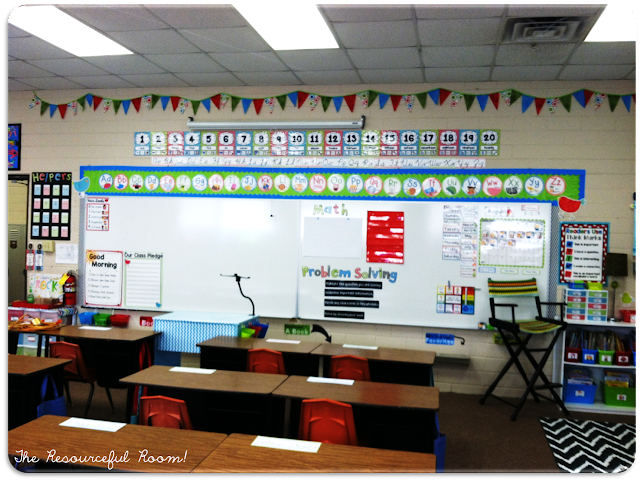 It's the final day of teacher week over at Blog Hoppin, and we are talking about our favorite subject to teach! 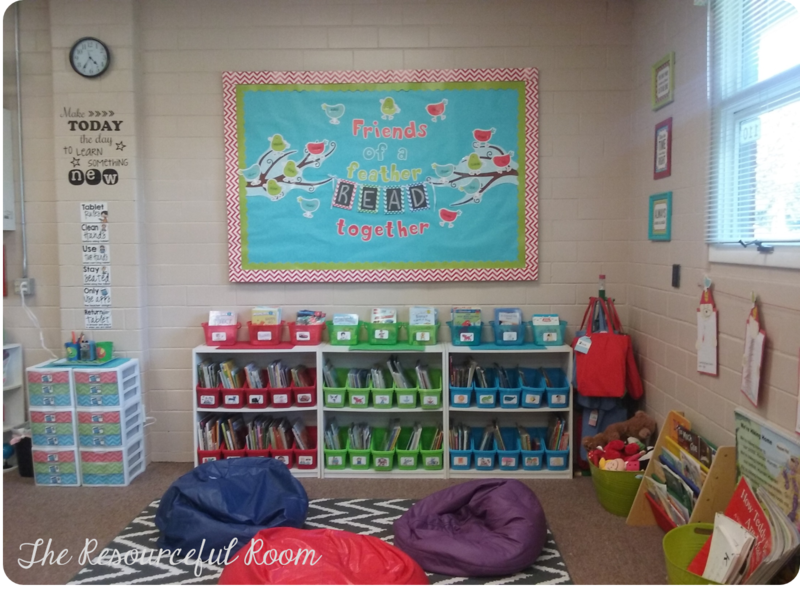 Reading is my very favorite subject to teach - If you want to read more about that you can check out my post on the Blog Hoppin blog today! I did say I may have 2 favorites. Since becoming a second grade teacher.So I'm sharing my other favorite here! As a general education teacher I've had the first opportunity in my career to teach science and I have to say I LOVE IT! Maybe almost as much as reading. I know that my students love it, and it's mostly because of the fun hands on lessons we get to do. Right now we are learning all about the states of matter and Hope Kings unit is amazing! It's filled with engaging activities to help teach all the important details. From day one I had my students attention when I pulled out a water balloon and a frozen balloon, they've been captivated during science every since! We made these colorful flip books to help us identify the different states of matter and record our vocabulary words. 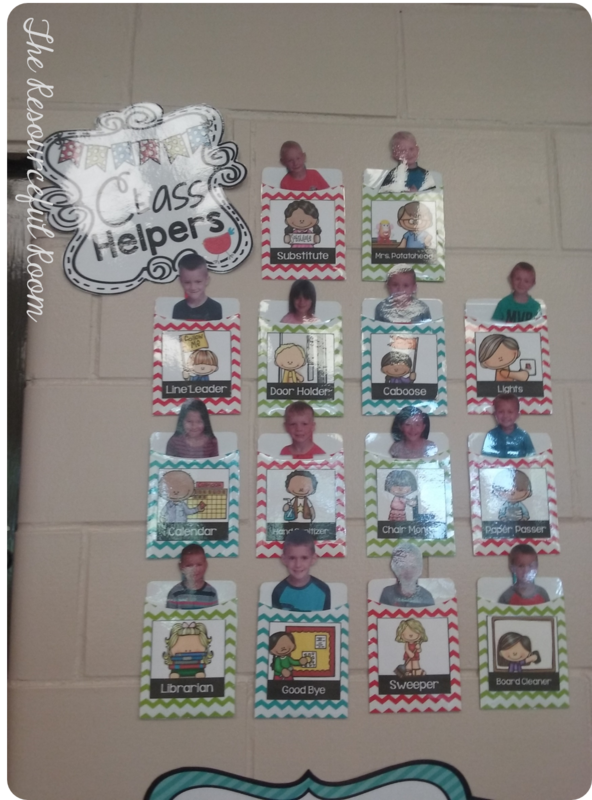 It has different pictures for them to cut out and glue under the correct heading to identify what state of matter that particular object would be. Then we took a look at what molecules look like in different states. 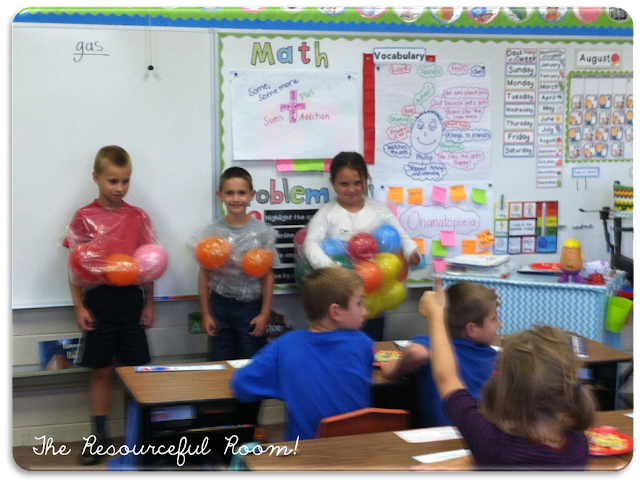 The person wearing lots of balloons represents solid, the person with a few balloons is liquid, the person with just two balloons is gas. They jump around and watch the molecules move, or not! 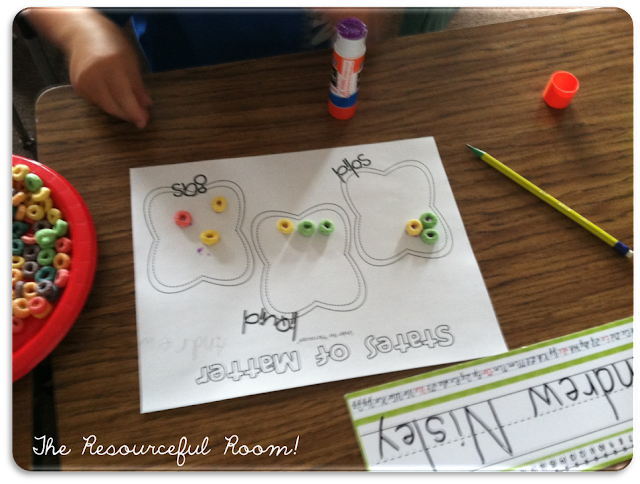 They glued fruit loops to the recording sheet to represent how the molecules looked during each state. I know they are going to be so excited today when they see bottles of soda and pop rocks candy on the science table! 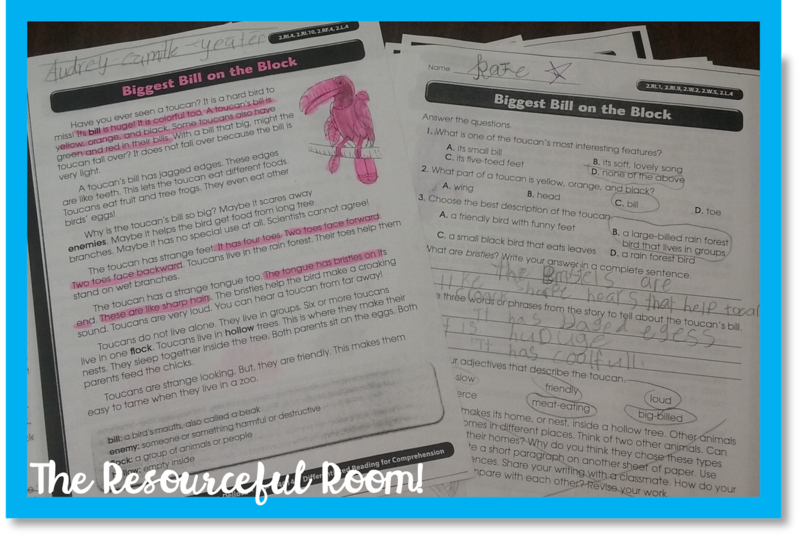 I have so much fun prepping for these lessons and can't get enough of the excitement they generate in my students. So science is also my favorite subject, almost right up there with reading! What is your favorite subject? 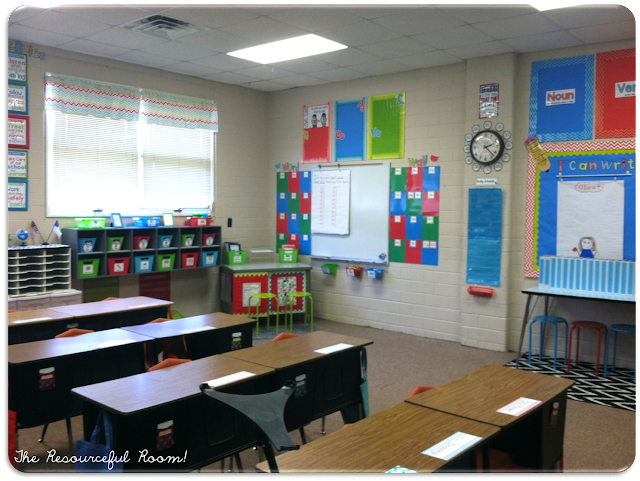 Come on over to Blog Hoppin and link up with us so we can see what gets you excited about teaching! 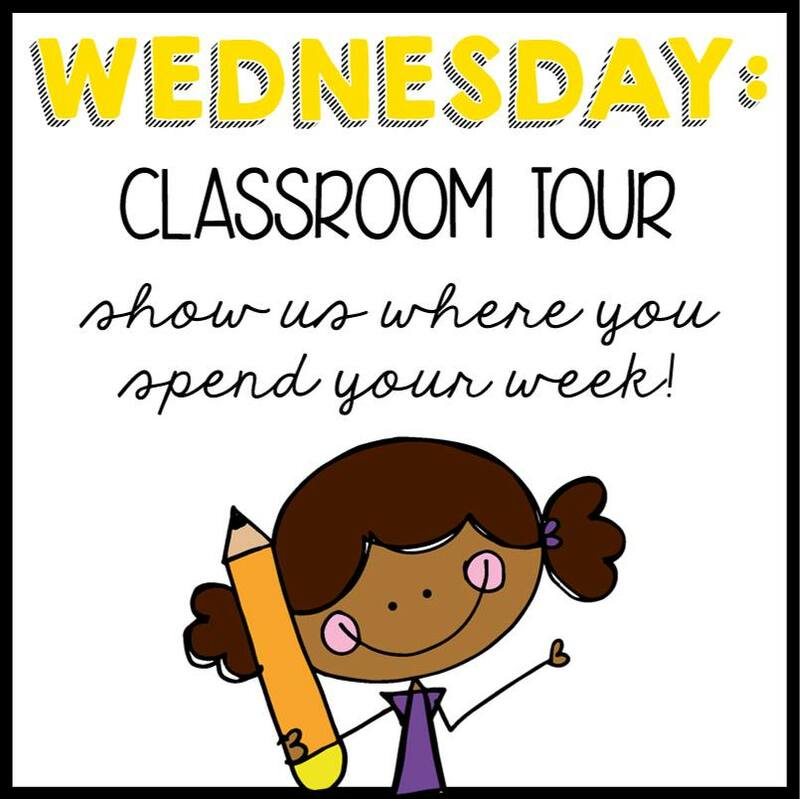 It's Wednesday - I get to show you where I spend my week! 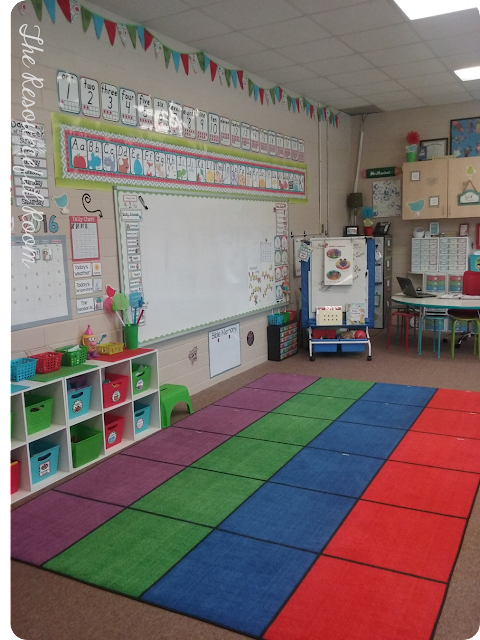 I kept the same color scheme for my classroom this year, but I did change a few things around.I'll try to give you as many details and I can, Let's start in the hallway! These are the student lockers outside our door. I love the silhouette kids in Maria's Classroom and thought it would be a perfect fit for this area that I don't wan to have to climb up to change out. I teach at a Christian school and we have a Bible memory program. 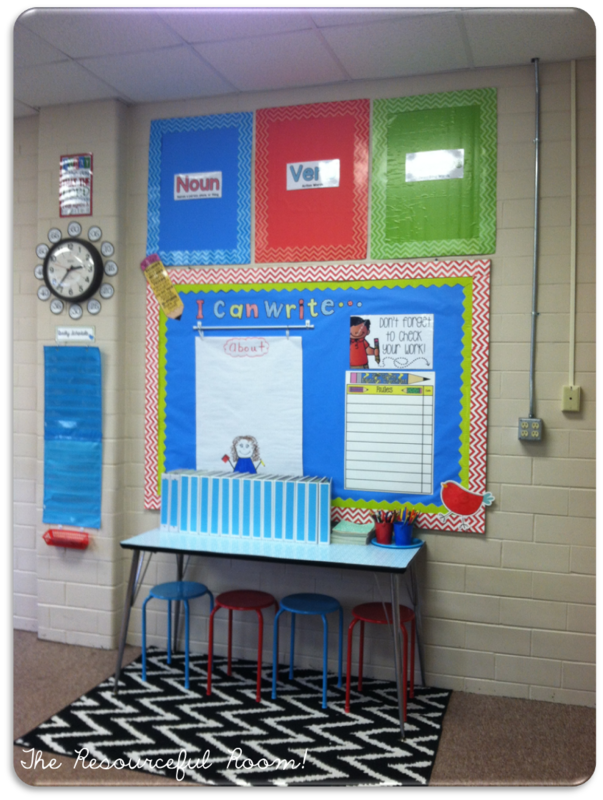 Each week students memorize verses, those verses are on the cutouts along the wall. When they memorize the verse they get a heart to color and it goes up next to that verse. 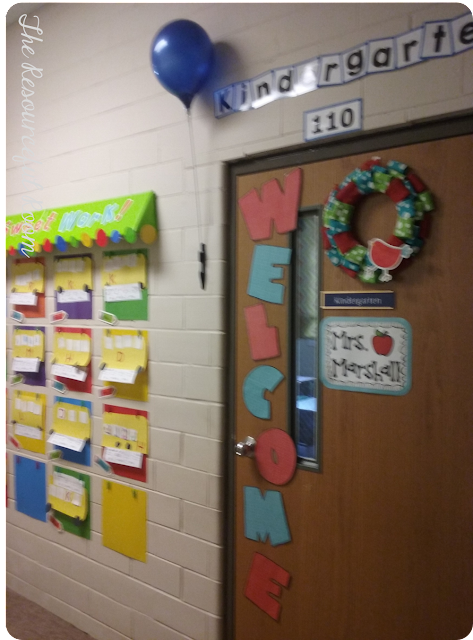 The words say "Thy word have I hid in my heart..."
This is the door to our classroom, I made the welcome letters above the door and the 2nd grade sign. To the right is our work display board. I used scrapbook paper and clothes pins to make a quick easy place to display our work.. I got the "Great Job" and "Wow" dots from Dollar Tree. 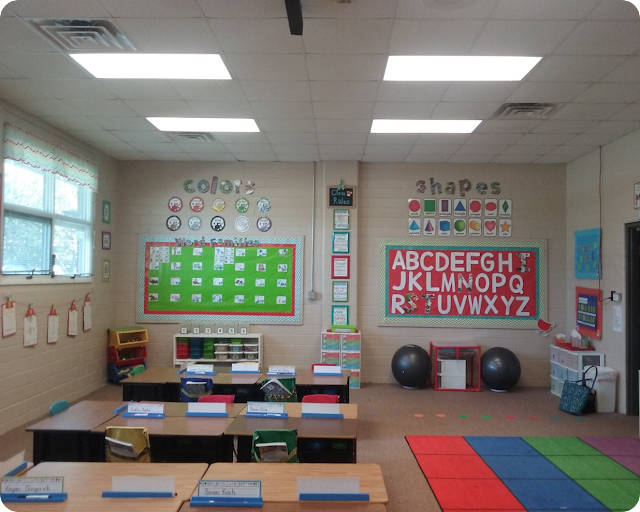 The whiteboards are new this year, we replaced the old chalkboards and it brighten the room up so much! I've placed all our important reference posters above the board, Alphabet, Numbers to 20,and cursive alphabet. I created all of these last year. You can see under the board I have a gutter used as a books shelf. This year I decided to make some labels so that one end will hold new books, the middle is a place for students to put books they love and want to recommend to others, and the far end holds my favorite books. I'm loving the excitement It's generated already to have someone share a book and place it in the shelf. 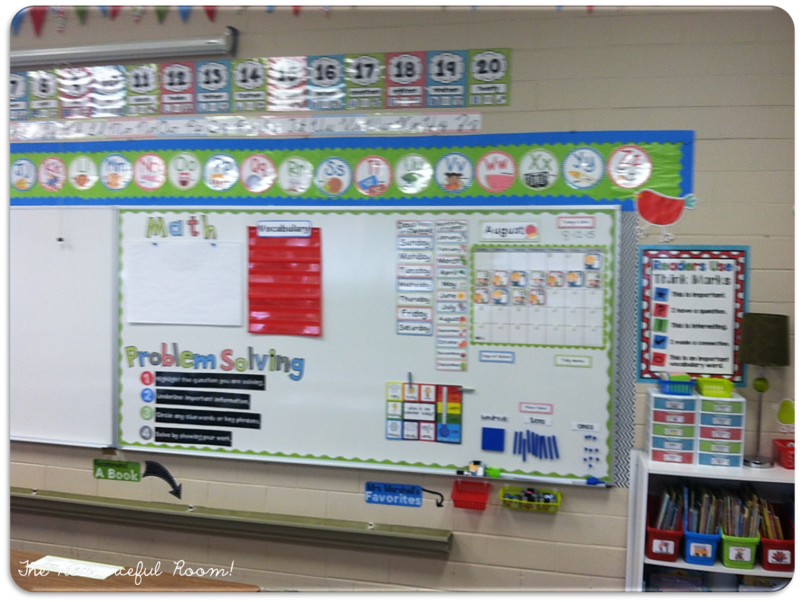 One end of the whiteboard is serving as our math focus board and calendar wall. I love having everything magnetic for the calendar. I've had a few questions about the baskets under my boards, I used these small baskets from dollar tree that have wire handles and binder clipped them to the ledge of the white boards, makes a great place to put magnets, markers, and erasers! I used this board for our CAFE board last year, this year I'm using it more as a focus wall. the white rectangle is labeled "our thinking" and we use it to put all our sticky notes with our thinking about the story we read each week. Our anchor charts are hanging here and the small pocket chart is used for vocabulary words. The blue small board to the left is for our author and genre study posters. 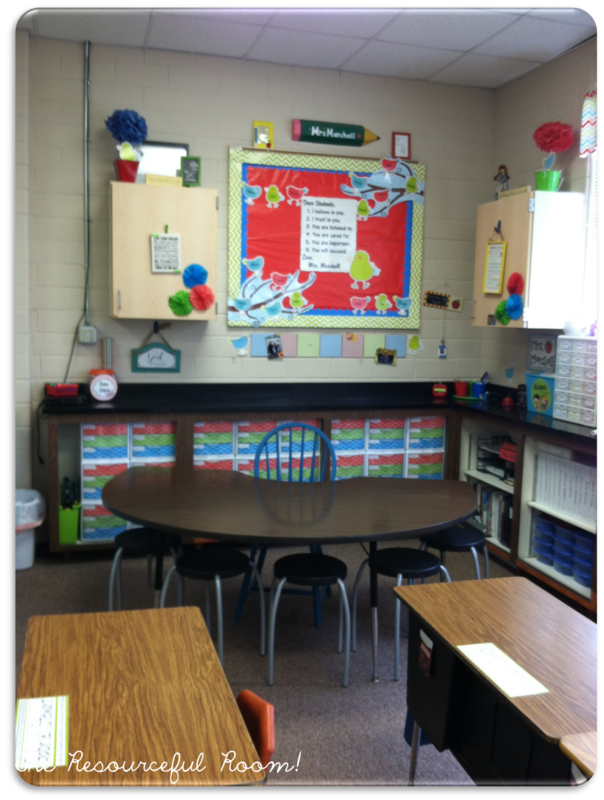 In the back left corner is my small group/teacher area. You can see on the back of the library book shelves I put hooks to hold our sight word reading cards and fluency phrases. 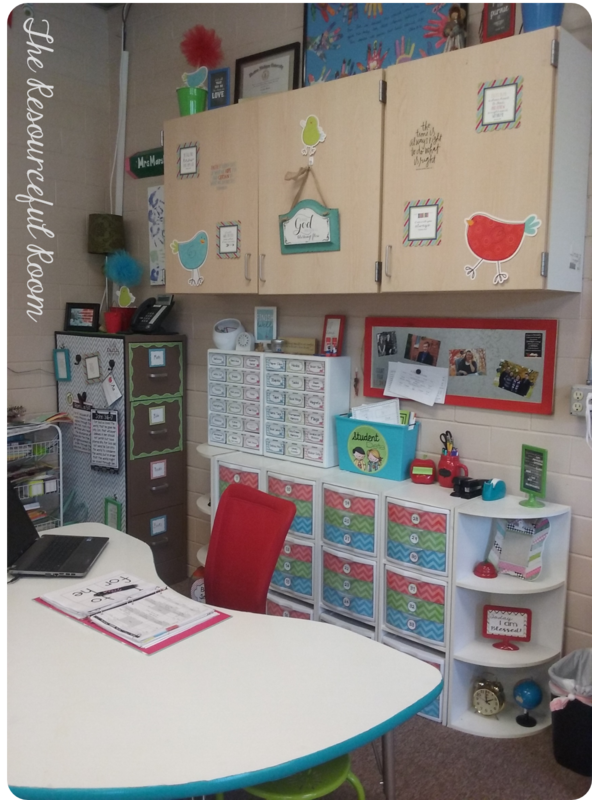 The drawers behind my table are housing all the materials needed for each story in our reading curriculum plus my grammar units. I LOVE this organization system! It has been wonderful. In this picture you can see the shelf to the right, it holds my teachers guides, and paper trays for each day of the week where I store all materials for my lessons, the furthest shelf holds our student data binders/learning portfolios and our base ten blocks in the divided containers. Along the back wall I have two sets of these cubbies, this set is holding math manipulatives and math tubs. 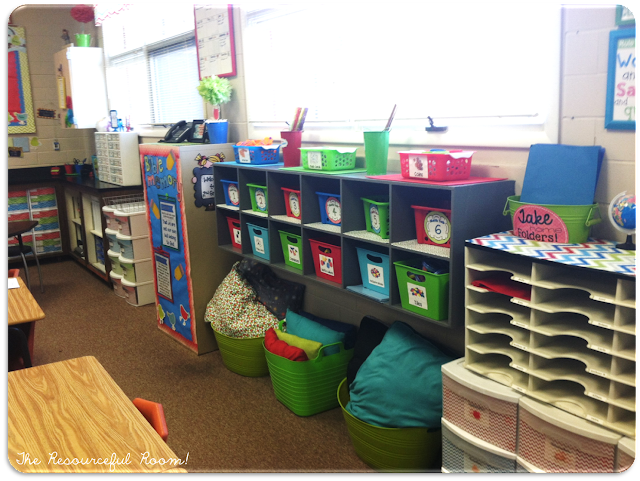 Underneath I have bins for our pillows we use during work time when we work around the classroom. This is helping keep them much more organized this year. Here you can see the my filing cabinet, I'm using the side to display our bible memory verses. Above that is our birthday poster. 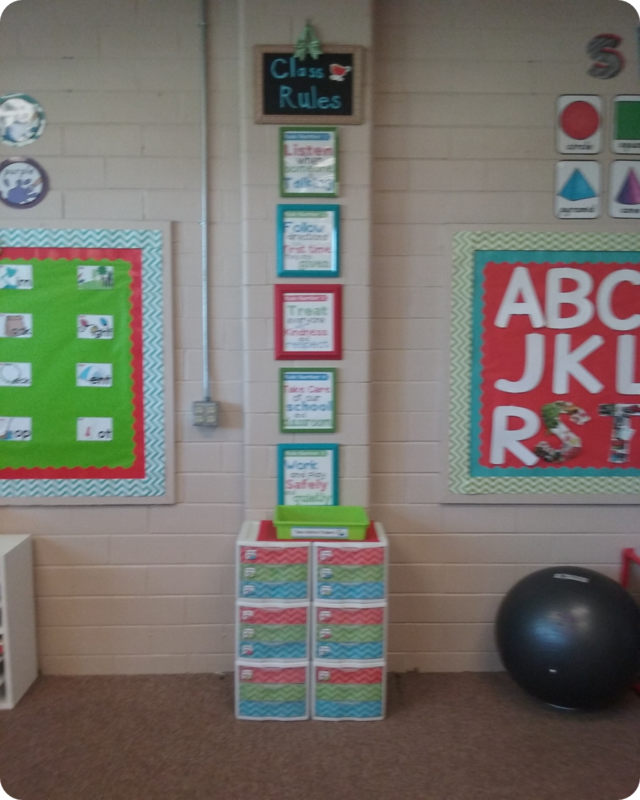 To the right of the math cubbies is our student mailboxes and class rules. 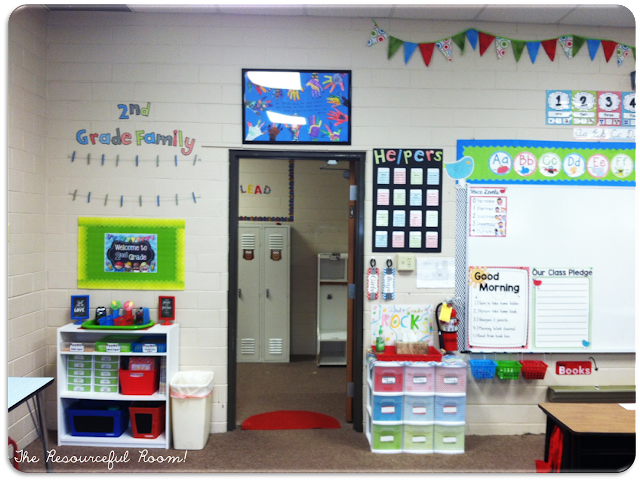 The second set of cubbies on the other side of the mailboxes is where I keep our word work tubs and manipulatives. 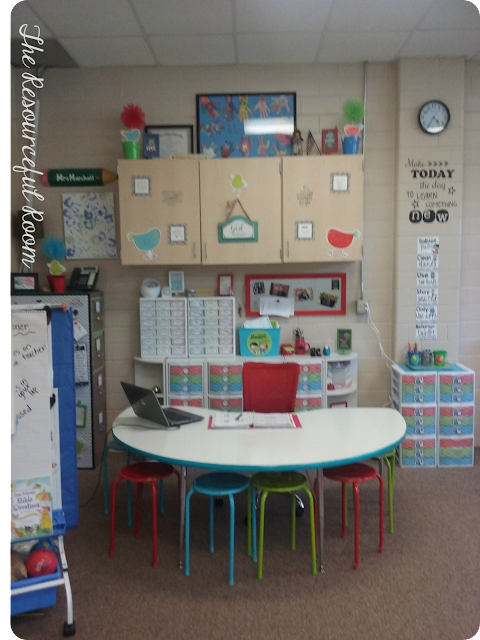 I am not using my teacher desk this year so I put it in the corner and got the stools from Family Dollar to put in front of it, ti makes a perfect work space for working on words. 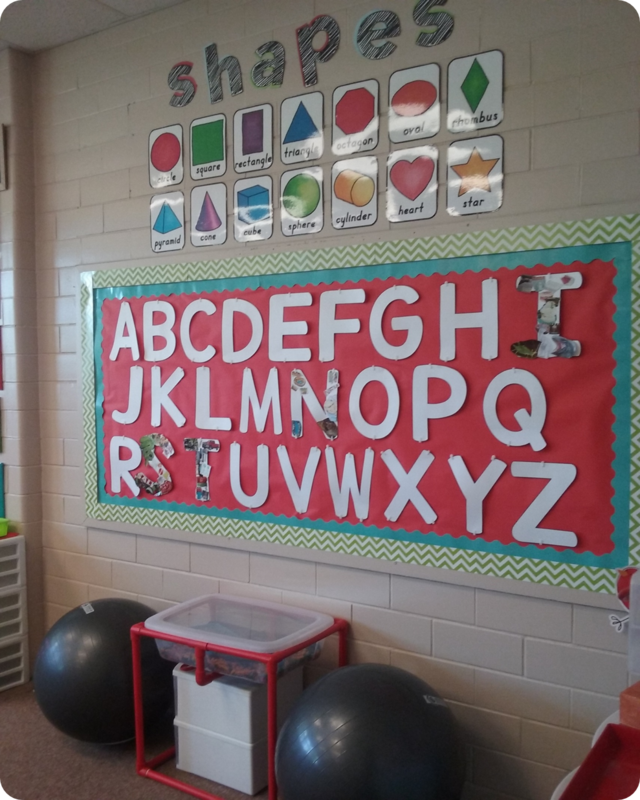 In the back right corner I have a smaller white board that I use to put spelling words on, the kids can also use it practice the words or with the magnetic letters. On either side of the board is our word wall. I laminated colored card stock and used it to make this -LOVE how it's working for us. Above the board we will display our vowel teams as we learn them. Between our word wall and our writing center there's the clock and our schedule goes in the pocket chart underneath. The basket on the wall holds all our schedule cards. I covered this table with contact paper and got the stools at Family Dollar. 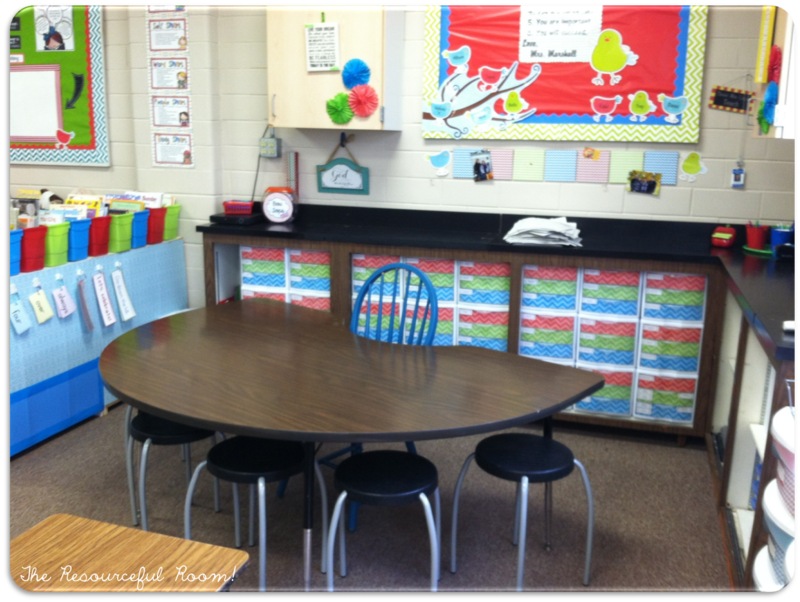 The binders on the table are our writing notebooks. 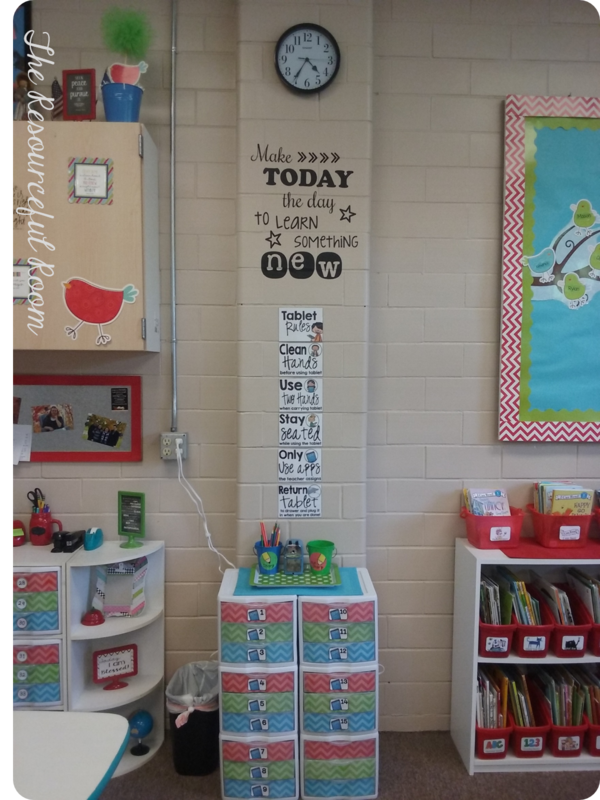 We will display our writing anchor charts here, and the poster with the pencil on it is a part of Amanda Maddens writing notebooks packet, we use it to display the grammar skills we've learned. Back around the the front of the room, this shelf to the left of the door holds all community supplies we might need. 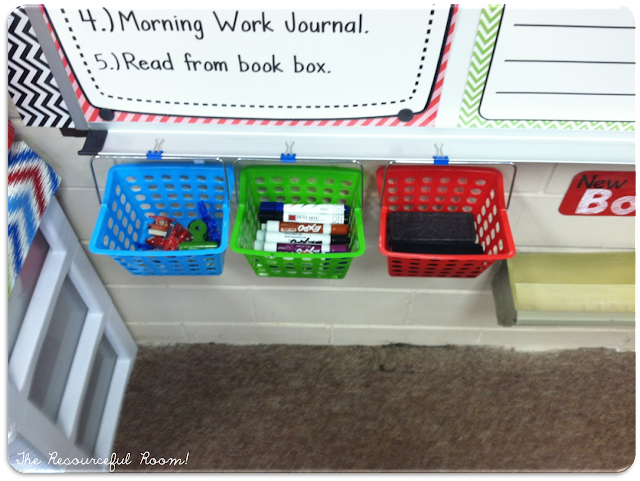 The tubs on the bottom have brooms and cleaning wipes in them, Our pencil sharpeners are on top. The clothes lines are holding pictures of us throughout the year, right now they have a family picture from each student that they brought to share. 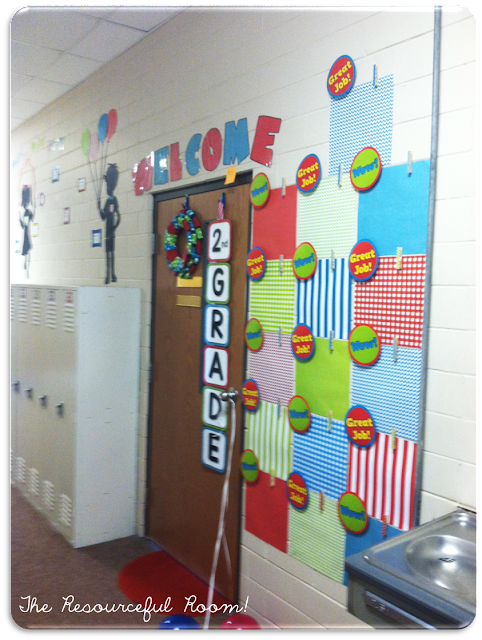 Above the door is a class poster that last years 2nd graders made it has each of their hand prints on it. 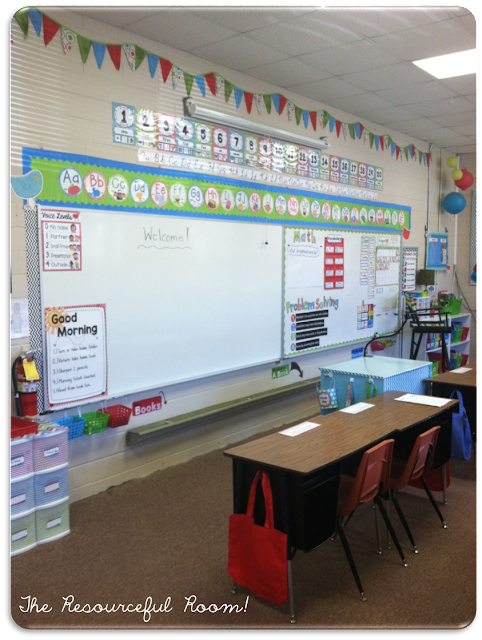 To the right of the door we have our class helpers board, passes, and sanitizer/tissue station. The narrow drawers hold extra sanitizer and tissue. 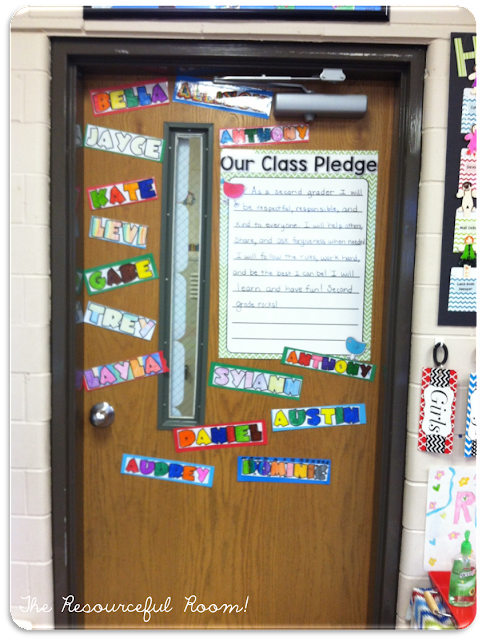 When our door is closed you will see our class pledge and name tags we made on the first day of school. Here's one last view from the back of the room facing the front! I really love how it all came together, it's functional and organized. I feel like we are making the most of all our space. 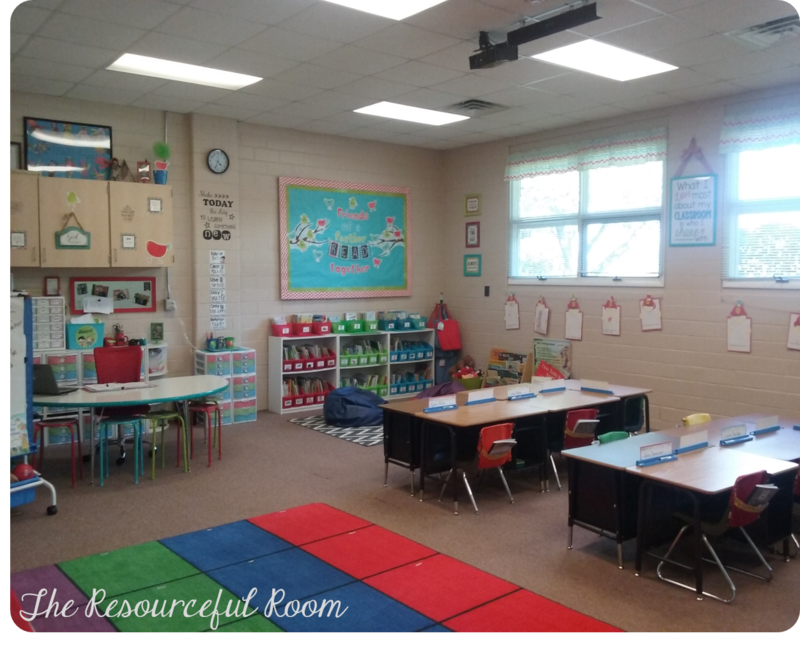 I love looking at other classrooms if you do to head on over to Blog Hoppin and check out all the other teachers sharing their spaces today!